It is plain to see that women’s skateboarding has experienced exponential growth in the past few years and that it’s rate of progression is rapidly increasing. The X-Games web cast hosts consistently expressed how impressed they were with how far the women have come as they commentated during the Women’s Street Competition. It seemed like the commentators were in a constant state of pleasant surprise as they watched the contest unfold. 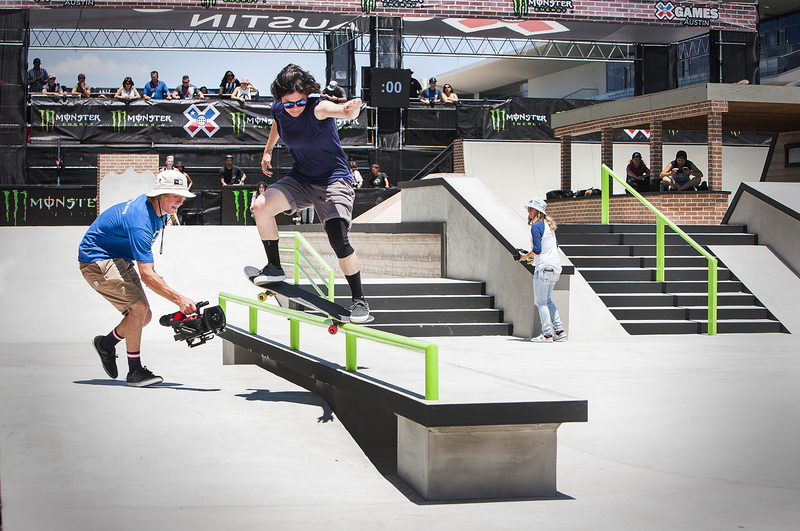 It was exciting to see an increasingly global representation from the women of X – Games. This year’s addition of Kate Shengeliya from Russia, Mariah Duran from Albuquerque, NM, and Gabi Mazetto from Brazil added new tricks and styles to the event. The prelims had a pretty challenging format- the best out of two 50 second runs determined whether you made it to finals. Each girl had a different approach on how to best adapt to the format. Samarria Brevard’s strategy was far from conservative- she consistently committed to going for the biggest gaps on the course. With her new Hoopla pro model under her feet, Samarria went for what could have been some of the biggest tricks of the day – she was close to a huge kickflip off of the bump, over the flat and down the 5 stair and she also used the same kicker to lauch her over the flat into a boardslide down the handrail. She made these in practice but unfortunately didn’t get a chance to pull them off in the heat of the contest. Each girl seemed to have something special to add to the mix. Colorado’s Rachel Reinhardt started the contest with a flawless euro gap double flip. Mariah Duran had a fun, creative approach — She no-complied out of back 50-50’s and even took one of her 50-50’s down a hubba and instead of popping out, continued the grind down the transition at the edge. Gabi Mazetto boardslid the 9 stair handrail and then got very close to a fully extended benihana down the 5. Alana Smith went for some big tricks like bluntslides on the a-frame and ollies off of the roof but she couldn’t quite stay on. Kate Shegeliya had some fun tricks planned as well- including ollie airwalks down the 5 and pop-shove’s down the 9, but unfortunately she couldn’t get those in the two allotted runs. Leticia Bufoni demonstrated her usual speed and style throughout the course. She had a run planned that she tried to put together throughout prelims and finals. She started each run by blasting a backside grab over a gap and then throwing backside and frontside lipslides down the rails. Unfortunately she was not consistent enough to make it onto the podium. Marissa Dal Santo was the only one to ollie the lengthy 9 stair during the contest. A consistent qualifying run got her into finals where she put together a run including: boneless down the 5 stair, bs flip up the euro, and a boardslide to fakie followed by a fakie flip. Lacey Baker had a very strategic run planned. She tucked tricks into nearly every feature: Instead of just using the banks as a way to set up for the bigger features, she threw in flip tricks and creative bonelesses. Her runs were very technical and even included nollie heels and kickflip nose manuals. She was consistent throughout the prelims but unfortunately couldn’t stay on it through finals. It is a joy to see Vanessa Torres truly expressing her talent. She dominated every rail on the course with her characteristically edgy style. She put down long, stylish crooked grinds, front smiths and even a front board down the 9 stair. She was all smiles through finals and scored 3rd place overall. Pamela Rosa was one of the most consistent skaters of the day. She made it into finals and then absolutely dominated her first run: She smithed the bump to rail, boardslid the 9 stair, tre fipped the bump, frontside 5050ed the down rail and then kickflipped the euro gap. She then ended her powerful run with a feeble grind down the 9 set. Alexis Sablone’s architecture knowledge inspired her to see the course differently. She saw lines lines on the upper level of the course that none of the other girls even touched. Alexis started each run on the roof with kickflips over the upper roof gap. She 50-50ed this gap as well before going down to the lower level to lipslide the rails and skate the 9 stair. In qualifiers, she frontside 50-50ed the huge 9 stair hubba. However, she blew everyone away in the finals when she kickflipped into it. She did this seemingly effortlessly, even though no one had even seen her practice it. 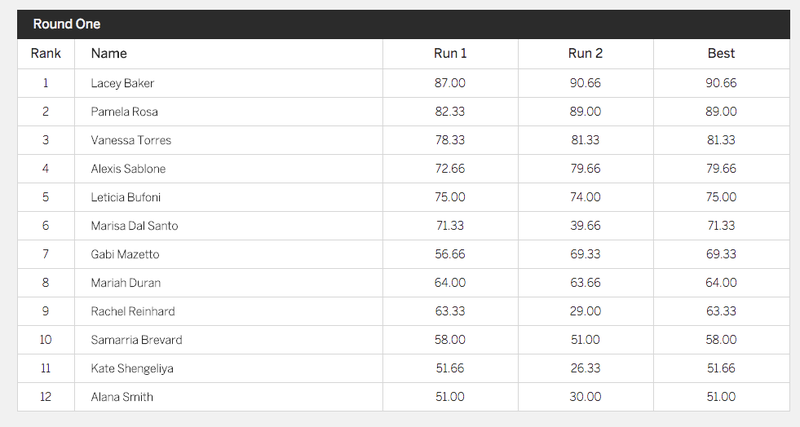 Throwing the biggest trick of the day into her run put Alexis Sablone into 1st place. It was great to see all of the girls celebrating one-another’s victories in between runs. Even the new competitors were welcomed by the veterans with hugs and high fives after each of their runs. 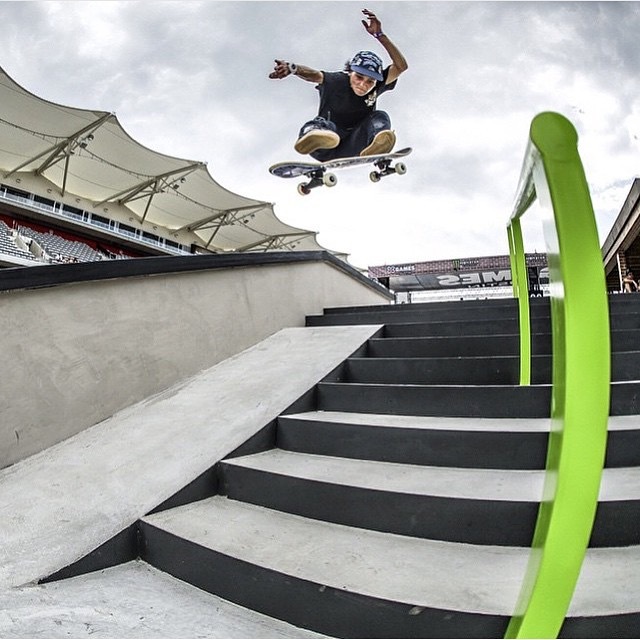 The increasingly global group of participants represented at X-Games is a great way to demonstrate that women’s skateboarding is growing on a global scale and this growth is being welcomed with open arms.